The Activities Block displays the activities that have been created in a course. For details on each of these activities, visit the Moodle 3: Activities & Resources: LSU Overview. *NOTE: The Activities block is only available to add when you are inside a course and in edit mode. Click the green edit button at the top right of the page. Also, it will only show Activities currently active in that course. 1. Find the Add a Block option at the bottom of the Moodle page. 2. Select Activities from the Add drop down menu. 3. 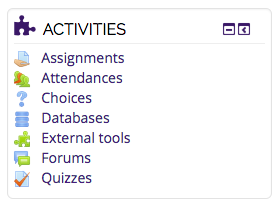 The Activities block will appear on the right-hand side of the Moodle page. Clicking on one of the Activities will direct the user to a page that displays each individual activity. For example, if a course has multiple quizzes, it will display each quiz and its location in the course. Clicking on the quiz will take the user directly to that activity.